Margaret Hedderman and her father, Bobby Hedderman, found the track along Queen Charlotte Sound to be one of their trip highlights. 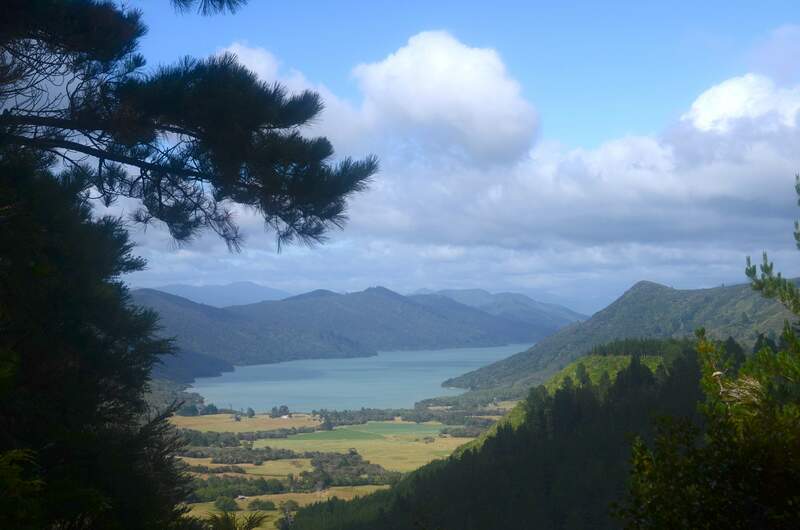 The Queen Charlotte Track begins the South Island portion of Te Araroa, a 3,000-kilometer walking trail that spans New Zealand from north to south. The Queen Charlotte Track is a 70-kilometer cycling and tramping track near Picton, New Zealand. Not surprisingly, it overlooks Queen Charlotte Sound. The water taxi bounced across white-capped waves, rain and saltwater splattering on the windshield. On board were a dozen or so other hikers and mountain bikers – mostly Americans and a few Europeans – bound for Ship Cove in the Queen Charlotte Sound of New Zealand. For Dad and I, the Queen Charlotte Track was the start of Te Araroa on the much-anticipated South Island. Just more than two months before, we had set off from the northernmost tip of the country on a 3,000-kilometer (1,864-mile) hike across New Zealand. Officially opened in 2011, Te Araroa is noticeably a new trail on the North Island, with its fair share of kinks, confusions and long highway connections to be worked out. Dad and I had been dreaming of the South Island, with the promise of six- to eight-day stints in the remote, mountainous backcountry for weeks. And here we were. The captain tossed our packs onto the dock. He was in a hurry to get out of the rain, but he didn’t seem to mind leaving us out in it! We watched him disappear between the long forested fingers of the sounds, the noise of the motor dissolving in the rain. There wasn’t much use standing on the dock in this downpour, so we started walking. The Queen Charlotte Track is a 70-kilometer walking and cycling trail that runs relatively northeast to southwest through the sounds. Along the way, a string of bed and breakfasts, campgrounds and even pubs, all of which are serviced by boat, cater to every kind of travel from day-tripping to tramping to luxury hiking and cycling. It is hardly a backcountry experience, but we didn’t mind this leisurely warmup for the Southern Alps. It was lunchtime, and the rain had still not let up. We turned off the trail at the first sign of a cafe. The Furneaux Lodge called for “smart attire only” at the bar. There was nothing smart about our appearance (or our fragrance, for that matter), but we marched across the green lawns, onto the wraparound porch, and into the early 1900s lodge anyway. It would appear there was a wedding party in progress, or at least there would be as soon as it stopped raining. No one seemed to notice our presence – or perhaps politely ignored it – and we were able to warm up with espressos before heading back out. The Furneaux is one of several locations along the track where you can ship your luggage ahead and enjoy the pure, uninhibited bliss of walking or cycling without 25 pounds on your back. But that’s not what we did. We didn’t know that was an option. 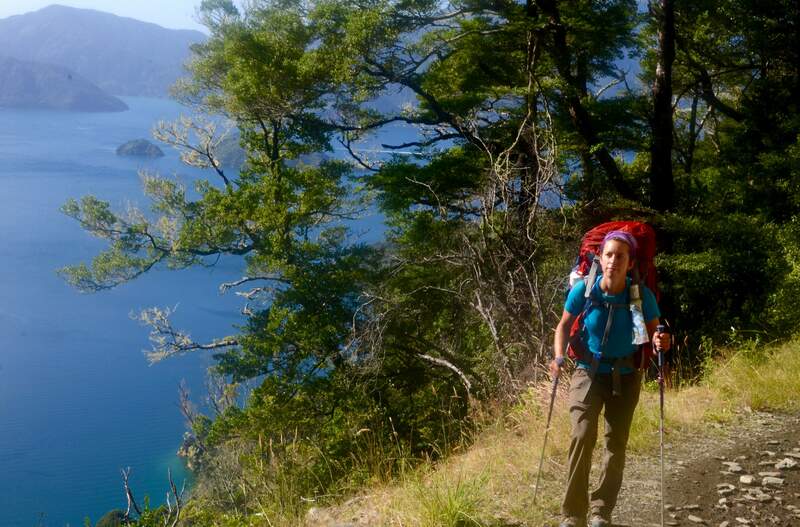 Even with full packs, however, the Queen Charlotte Track quickly became a highlight of our 3,000-kilometer trip. The trail easily undulates up and down, around and across what would have once been a great mountain range. But, even 80 million years ago, the ocean proved its power for change, flooding the long corridors of river valleys, making molehills out of mountains. The sounds long have provided calm waters and safe harbors to sailors, including Captain James Cook, who first discovered the passage between the North and South Islands from this area. After three days and one hour, we emerged in Anakiwa, a town that seems to exist only for the purpose of receiving hot, hungry hikers from the trail. We checked in early at the YHA backpackers hostel. The owner subtly mentioned how offensively smelly Te Araroa trampers tend to be. We got the hint, cleaned up, grabbed a scoop of ice cream, then sat back to watch the ocean. The Queen Charlotte Track had been an easy walk, and in retrospect, we were in no way warmed up for the mountains to come. Margaret Hedderman and her father, Bobby Hedderman, began hiking the Te Araroa Trail in early November. They plan to take six months to finish. For more on their journey, visit www.NewZealandOnFoot.com.